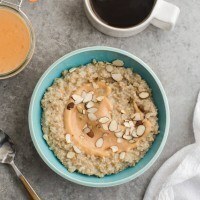 Steel Cut Oats with Citrus Curd | Naturally.Steel Cut Oats with Citrus Curd | Naturally. Prepare curd according to directions the night before. Use maple syrup in place of honey and the citrus for the citrus juice. Store in an airtight container and cool overnight. In the morning, combine milk and water in a pot. Bring to a simmer, add oats and salt, reduce heat, cover, and cook for roughly 15 minutes (add/subtract time as desired for consistency). Remove from heat and let sit for 5 minutes. To serve, divide the oats into two bowls, add a few tablespoons of curd, and sprinkle with toasted almonds. Recipe for curd from Cookie and Kate.